Three holdovers from the twenties, Charlie Chaplin, Buster Keaton and Harold Lloyd all made films in the decade, still captivating their faithful fans if not the critics. The four Marx Brothers and W.C. Fields were the fresh highlights of the era. Their styles were widely different. 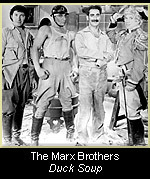 The Marx Brothers, Harpo, Zeppo, Groucho and Chico were physical comedians and employed a hilarious slapstick style. Fields, on the other hand, played the raucous and self-centered loner at odds with others. The characterization enabled him to express gleeful and sly humor. 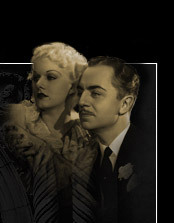 In 1933 he made three of his funniest films, The Old-Fashioned Way, Mrs. Wiggs of the Cabbage Patch and It's A Gift. A more sophisticated comedic genre ran parallel throughout the period. Screwball Comedy made stars of Katherine Hepburn, Carole Lombard, Claudette Colbert, Jean Arthur and Irene Dunne. On the male side, Cary Grant was the master followed by.James Stewart, William Powell and others figured prominently. Even John Barrymore, though not a comedian, appeared opposite Carole Lombard in Twentieth Century, an exceedingly amusing film.